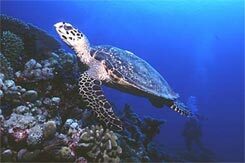 other characteristics: The green marine turtle is the second largest marine turtle of the world. Even though it is near extinction it is still eaten in some countries. The young animals feed on cancers, the adults live vegetarian.